Wave is great for creating documents collaboratively. Our vision is to enable all these break-through collaborating features in a modeling tool (think: web-based Visio). Therefore, we are working on the integration of a process model editor called "Oryx" into Google Wave. Never heard of Oryx? Well, let's hear some facts: Oryx is a graphical process model editor that runs in the browser. The Oryx project has been started in 2006 and is fully open sourced under the MIT license. It was initially designed for the creation of business process models using the Business Process Model Notation (BPMN), Event-driven Process Chains (EPC) or Petri Nets. 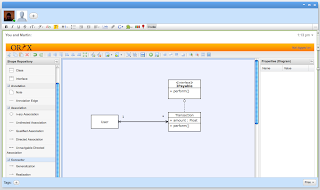 However, because Oryx is extensible via plugins the technology can be used to create all sorts of different models such as UML class diagrams and even GUI prototypes. We want to make Oryx collaborative in a way that enables multiple users to edit a model simultaneously. Imagine seeing other people dragging shapes around in real-time or an awesome playback feature that shows you how the model evolved. We are very excited about this project because it is to our knowledge the only endeavour to integrate a large software product into Google Wave. Is the screenshot real (prototype) or just a composition? Thanks! It's a real prototype :) not ready for release though.